Advertising to the billion active daily users on social media is a smart way to increase website traffic and purchases during the upcoming holidays. According to Facebook's 2018 Holiday Study, 55% of US shoppers said Facebook would influence their holiday shopping; 42% of US shoppers said Instagram would influence their holiday shopping. Instant Experiences are mobile-optimized experiences that are designed to capture the attention of your audience and increase your engagement. You can build them using templates provided by Facebook by editing the text and putting in your own creative assets. When the user clicks on the ad, Facebook will open the Instant Experience instead of taking the user to a landing page. This way the user can interact with the Instant Experience, which can include images, videos, and descriptions. However, as the user scrolls down, they will be taken to the landing page once they hit the bottom of the Instant Experience page. A benefit of the Instant experience is that you can customize the text within the call the action buttons. 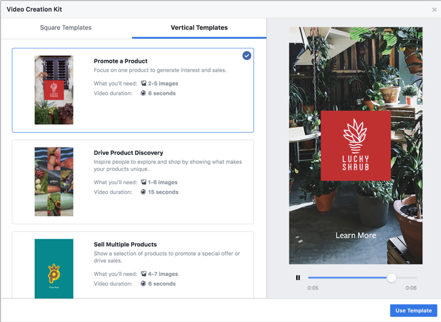 By using the Video Creation Kit, you can create mobile-first video ads that use existing photo assets, text overlays, and logos. There are templates that you can customize in Ads Manager or from a Facebook Page and then use in your ads that run on Facebook or Instagram. Each template aligns to a different goal, whether you're promoting a new product or telling a brand story. CBO is a way of optimizing the distribution of a campaign budget across your campaign's ad sets. This means that Facebook will automatically and continuously find the best available opportunities for results across your ad sets and distribute your campaign budget in real time to get those results. While using CBO, each campaign should only use one targeting strategy, but you must have at least two ad sets within the campaign. Tip: CBO would be a good strategy for those with limited budgets. There are a few new placement options within Facebook including Marketplace, Messenger and Instagram Stories. Marketplace allows ads to run next to organic posts from other sellers. The CPCs (cost per clicks) in Marketplace have been low since this is a new placement and not everyone has enabled it yet. Messenger allows you to show ads right in the Messenger app. This is a good place for branding play, which allows you to get your brand name in front of potential customers. Instagram Stories is the last new placement that has the ability to receive higher impressions. Based on stats from Instagram, one-third of the 400 million accounts using Instagram stories comes from businesses, and one in five stories receive a direct message from the views. The shop section is a tab you can add to your business's Facebook Page that lets you list products you're selling and connect with more customers on Facebook. The benefit of having a shop section is that you can now tag your products on Facebook and Instagram posts which can then be promoted. Once a product is tagged on Instagram, it may appear in the Shopping Channel. This is a new, free feature of Explore on Instagram. These adjustments allow you to make sure that you are taking full advantage of the tools that both Facebook and Instagram have to offer. They will allow you to drive growth on social media during the holiday season.